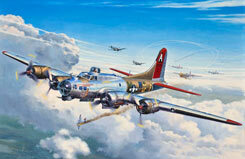 All Products > "04283 Revell 1/72 B-17G"
The B-17 Flying Fortress is the best-known American bomber of World War II. Heavy losses in 1943, when a total of 120 bombers was shot down, lead to the conclusion that previous B-17 versions carried insufficient defensive armament. As a consequence, the front lower nose of the B-17G was equipped with a turret carrying two 12,7 mm machine guns, providing an effective defense against the feared frontal attacks. Simultaneously, supplementary gun positions were added to the fuselage sides. The crew now being able to defend itself in all directions resulted in a sense of safety, which was also reflected in its nickname "Flying Fortress". Although it was mainly used over Europe and the Near East, it also delivered invaluable services in the Pacific theatre while flying sea patrol, reconnaissance and bombing missions. A total of 12.731 "Flying Fortress" was built of which 8.680 machines were G versions. The last B-17G left the factory on July 29, 1945. This B-17G-35-VE 42-97880 "Little Miss Mischief" was delivered on 23 March 1944 and served from 15 June 1944 till 4 April 1945 with the 91st Bomb Group, 324th Bomb Squadron in Bassingbourn, England and having flown 75 operational missions.